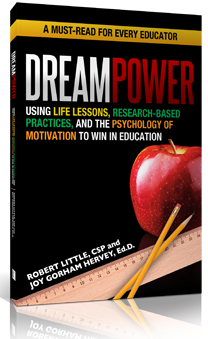 DreamPower: Using Life Lessons, Research-Based Practices, and the Psychology of Motivation to Win in Education breaks new ground by combining positive psychology with heart-warming stories. Little and Hervey support research findings in human motivation with real-life experiences and cues from best educational practices. They highlight what works to motivate today’s students, communicate and develop partnerships with parents, and address the necessity of self-mastery. Along the way, the duo highlights trend-setting educators who are enlisting new approaches to motivation and pointing a bold way forward. DreamPower, a provocative and readable desktop companion, is guaranteed to challenge every educator to rethink and improve the ways in which schools motivate students, teachers, and parents. According to the Book of Lists, public speaking is the number one fear of Americans-with the fear of dying coming in at seventh. Robert Little shares 20 years of experience in the training and speaking arena. In his book he offers specific techniques, fascinating anecdotes, and professional secrets of the trade. SPOKEN SUCCESS is packed with personal stories and common-sense approaches that have been specifically designed to give readers the skills and confidence they need to prepare and deliver speeches that will make a difference in their careers, their communities, and their personal lives. Beginning with the advantages of good presentations skills and techniques to reduce nervousness, the text moves through speech preparation, knowing your audience, using visual aids to answering questions and the do’s and don’ts of public speaking. Jamaal, an 11-year-old boy, tries to determine what he will become in life. However, this causes him to reflect on his surroundings and to think of reasons to fail. With the help of Mr. Cleo, a custodial worker at his school, Jamaal begins to understand that his current circumstances are the reasons why he should succeed. He learns at an early age that unfortunate situations can and should be used to motivate one to become successful — to take the lemons in life and make lemonade out of them. This teacher’s guide has instructional strategies and learning activities that are based on national standards. In this book, Jamaal’s Lucky Day, Jamaal has to make a tough decision whether to keep money that he’s found or return it to its rightful owner. From this experience, Jamaal, learns responsibility, courage, caring and honesty. The art and text together in this beginning reader book, Grandma’s Biscuits, convey the fondness of a young boy for his grandma’s biscuits. More importantly, it shows the love and bond between a grandmother and grandson. Mrs. Walker uses games and competitions to teach her third grade students the importance of acceptance, talents and teamwork.